The Dividist Papers: The Dividist is IN! President Obama's 2012 reelection campaign kicked off with a YouTube Video and an aggresive Facebook push. The revamped campaign website has the kickoff theme "Are You In?" featured prominently on the home page. That simple motto is pretty good carrot and shtick marketing - if you are not "In" helping Obama's re-election campaign, then obviously you are "Out" - you know - not one of the cool kids. YouTube is also one of the things that have apparently worked over the past few years. In emails and text messages sent to supporters earlier today, in which Obama announced that he would be filing papers to launch the 2012 campaign, the video below was promoted. Twitter, for whatever reason, seems to be not that big a deal for the campaign." The launch and video seems pretty basic, indulging in feel-good pablum and straightforward demographic campaign fare. Yet, it still provoked a range of reactions, including excitement (mostly on Facebook), ennui, sarcasm, pundits looking for hidden messages about the campaign, even some wishful thinking. The "Are you IN?" motto is kind of cute and it might motivate college kids to gird their loins for the campaign, but the Dividist is not sure it will help with the Independents and Centrists Obama will need for re-election. Even with the GOP helping out by doing everything they can to push Independents away. Given the low probability of the Dems retaking the House, and the high probability of Reps taking the Senate majority, the Dividist suspects the only way to maintain Divided Government into 2013 will be to re-elect President Obama. So the Dividist is grudgingly "IN" - at least right now, and until Mike Bloomberg makes a move. In the meantime, to help the President out, the Dividist has made a few improvements to the Obama campaign graphics featured in this post. The Dividist believes these changes may help the President with those Independent / Centrist / Dividists like himself, who are just not ready to give the Republicans all the keys to the castle yet again. It was not that much fun last time around. According to Ben Smith at Politico, the parody is getting more action that the real thing. It'll get easier for the President after the Republicans beat themselves into submission and field a candidate. The Dividist has HOPE. The Dividist is not ready to give One Party Republican Rule another turn at bat. The Dividist may be "in", and I was "in" with The Dividist for most of the way until The Dividist made one INCREDIBLE remark that I had to re-read 5 times before I could believe I understood what The Dividist was saying. No person who PURPORTS to be a social liberal could seriously suggest that MICHAEL BLOOMBERG is a better awful person to vote for than Obama is. That guy is a Nazi! 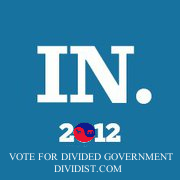 I will take your advice and vote for whoever (gulp) the Dems put up to keep our government divided. But Michael Bloomberg? NO. Over his dead body, no. Once you have shared with us your reasons for thinking Michael Bloomberg could be palatable as POTUS, I will share with you why I think he should be run out of the country on a rail or tarred and feathered. You have my undivided attention. Yeah... That was kind of a toss-off comment that either should have been deleted or deserved a bit more explanation. There are a few underlying, unspecified assumptions there. First Assumption - Bloomberg cannot win a Republican nomination, nor would he try, so if he were to enter the race it would be as a 3rd Party Independent. Third Assumption - If Bloomberg enters the race, it will be on a 3rd party ticket (the groundwork now being laid by "No Labels" much like "Unity08" was a stalking horse for Bloomberg in 2008). I'm further assuming (4th?) Bloomberg will pull more from the Republican vote than the Dems - taking the "secular" fiscal conservatives if the Republicans put up an aggressive social conservative. In that case, for those who really cannot stomach a vote for Obama, they could have the same effect of re-electing Obama by voting for Bloomberg. there are a lot of assumptions there - and I could be wrong on any of them - but that was what I was thinking when I tossed out that Bloomberg comment. That said - I'm still interested in your perspective on Bloomberg. From my distant vantage point on the left coast - I see him more as a craven political opportunist, rather than a social "Nazi" - I mean he did back the Moslem learning center and seems to stake out a lot of social liberal postions. Anyway, despite your violation of Godwin's Law - I appreciate the comment and question.